Looking for a Job? Check out the Spring Job Fair! For anyone in Evanston and the North Shore looking for work this summer, come join us at Youth Job Center's Spring Job Fair on Thursday May 24, 2018 from 3PM-6PM at the Y.O.U. Headquarters located at 1911 Church St. in Evanston, IL. If your resume needs a little work, you need interview prep, wardrobe assistance, or want to get fast-tracked on the day of the hiring event attend one of our YJC Job Fair pre-screenings on Monday May 21, 2018 OR Wednesday May 23,2018. Both pre-screenings run from 2PM-5PM and will be at the YJC headquarters at 1114 Church St. in Evanston, IL. Aramark, Chick-fil-A, Chipotle Mexican Grill, CVS Health, Evanston Minority Business Consortium, Nando's PERi-PERi, Nordstrom, Target, Whole Foods Market, and Youth & Opportunity United for being a part of this fantastic event and helping youth across the North Shore get access to amazing employment opportunities. CEDA, Chicago Cook Workforce Partnership, City of Evanston Illinois Government, Family Focus Evanston, Infant Welfare Society of Evanston,and Youth & Opportunity United for making this event happen! Together we can build a better community, one job at at a time! Learn more about YJC's Work-Readiness Training! To everyone who participated in this years Annual Appeal, we here at Youth Job Center would like to extend a sincere and heart-felt THANK YOU! Due to your kindness and generosity we were able to raise over $100,000 for programs that assist youth in their pursuit of success! For 35 Years, YJC has strived to improve the lives of youth through employment. Our work provides young people with improved job knowledge and competency, increased reliability and responsibility, greater self-confidence and interpersonal skills, positive employment experiences, and the ability to overcome obstacles as they inevitably arise. Your generosity truly makes a difference. • Supply 600 public transit passes so youth can access work even if it’s far from home. • Conduct 1,314 one-on-one career advising sessions for anyone who walks through our doors. • Offer 33 job-readiness training seminars and hiring events that teach hard and soft skills such as resume development, interviewing techniques, workplace expectations, professionalism, and more. Thank you again for your generosity and believing as we do that employment has the power to transform lives. Together, we can empower youth to pursue the future they want and show the world that if you can dream it, you can be it. Building Futures. For 35 Years, YJC has strived to build futures through employment. Our work provides young people with improved job knowledge and competency, increased reliability and responsibility, greater self-confidence and interpersonal skills, positive employment experiences, and the ability to overcome obstacles as they inevitably arise. The holidays are all about future-thinking: what is wrapped for us in that colorful paper, what awaits us in the new year, who will we celebrate with during the season. But I'm reminded that many children face challenges that put thoughts of the future behind other needs. The impact of poverty, violence, undereducation, and health can shadow the ability to find that promise of what's around the corner, or the potential of the future. For some, future-thinking is a luxury they cannot afford, as they persist through day-to-day challenges. Making a difference. At YJC, we work every day providing opportunities, building confidence, and broadening sight lines for the future. It is the support that comes from you that provides the essential tools and skills that sets up young adults for success and enables them to pursue their dreams. The promise of Hope. As the end of the year approaches, I would be remiss not to thank all YJC supporters for believing as we do that employment has the power to transform lives. Together, we can empower youth to pursue the future they want and show the world that if you can dream it, you can be it. On behalf of the entire YJC staff, I wish you a happy and healthy holiday season. Many thanks to everyone who supported YJC on Giving Tuesday. Because of YOUR generosity we were able to raise 100% of our goal, raising more than $10,000 for young people who are on a path towards the future they want! If you were unable to participate in #GivingTuesday, but are still interested in supporting Youth Job Center, it is never too late. Help us support youth and young adults in their pursuit of economic success and make dream jobs a reality for all! 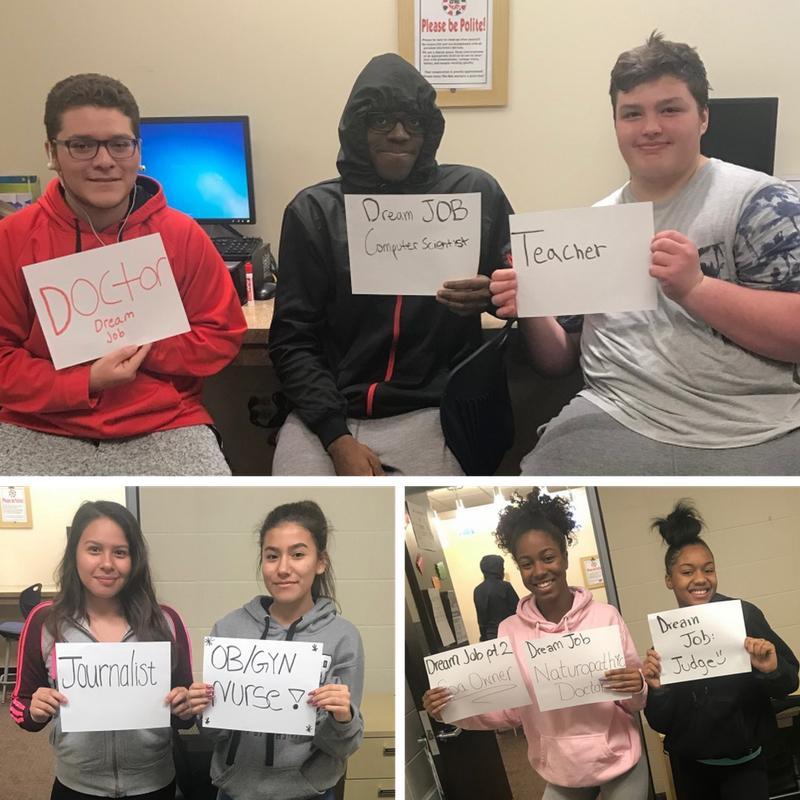 Youth Job Center (YJC) is one of two recipients of Bank of America Neighborhood Builders® grant, awarded for their work in providing job-readiness training and support to youth in the Chicagoland area. YJC’s programs contribute to Bank of America’s goal of developing pathways to economic mobility. Neighborhood Builders® (#NeighborhoodBuilders) will provide Youth Job Center with $200,000 in flexible funding, as well leadership development support and connections to peer organizations across the U.S. over the coming year. YJC will use the funds awarded to support the continued development and implementation of its postsecondary planning curriculum and tools for high school students across the region. YJC will also share its program components with other agencies to allow nonprofit partners, counselors and teachers to help youth explore the extent of postsecondary paths available to them. YJC will develop training support to ensure consistent, quality implementation of the curriculum in other agencies. The funds will also further the professional development training of its leadership team and staff who have supervisory responsibilities, including Executive Director, Karen Tollenaar Demorest and emerging leader and Assistant Manager for Employer and Partner Relations, Charity Freeman. On Friday October 27th, Youth Job Center was lucky to host a delegation of Youth and Workforce Development professionals from Morocco as part of the U.S. State Departments International Visitor Leadership Program. Youth Job Center was selected to participate in this program due to our 34 years of experience in Youth and Workforce Development in the Chicagoland area and we couldn't be prouder to share our experience and knowledge with our friends from Morocco. The International Visitor Leadership Program (IVLP) is the U.S. Department of State’s premier professional exchange program. Through short-term visits to the United States, current and emerging foreign leaders in a variety of fields experience this country firsthand and cultivate lasting relationships with their American counterparts. Professional meetings reflect the participants’ professional interests and support the foreign policy goals of the United States. Over the course of a few hours YJC staff and our visitors we're able to discuss the importance of engaging young people in employment, how to effectively develop programs and practices to help youth gain access to the resources they need to be economically self-sufficient, how to overcome the significant barriers that youth, both domestic and foreign, face everyday, and share our experiences in working with and helping develop the next generation for success in the workplace. Thank you to the U.S. State Department for inviting us to participate in this fantastic and eye-opening experience, and for our friends from Morocco for being such wonderful and informative guests. Congratulations to our April Client of the Month, Naeli Jimenez! Naeli has been working as a bilingual customer service representative at Stericycle for four months. Congratulations to our February Client of the Month, Terrance Freeman! Terrance has been working as a grocery clerk at Jewel-Osco for the past four months.